High-quality trash receptacle may be used in almost any location. 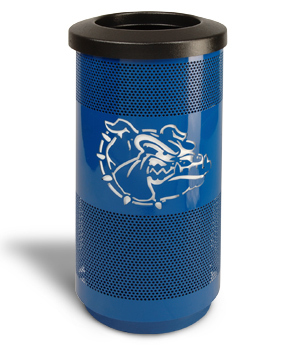 Customized with your team or company logo, it is perfect for high schools, sports teams or anyone looking for a unique advertising idea. Custom artwork is displayed on front side only. The 55 gallon receptacles come standard with leveling feet. Lift off top makes servicing easy. Top lid options include flat top, hood top and dome top. 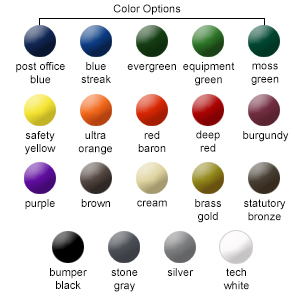 Available in powder-coated color options shown below. 35 gallon and 55 gallon receptacle bases are dipped in corrosion resistant plastisol for added durability and will match your chosen receptacle color. In order for our laser technicians to produce the most accurately cut panels possible, we	require that you supply the artwork in any of the recommended or accepted formats listed below. If you have any questions, please feel free to contact us and we'll be happy to explain exactly what we need to ensure our laser cuts are precisely what you're looking for.